For the nth consecutive year, I'm tracking the percentage of total minutes played by Canadian players for each of the countries now 5 professional teams, with Ottawa Fury making their debut in 2014. The tracking takes the form of a Google spreadsheet with a game-by-game participation of Canadian players, and occasional tweets giving an updated Canadian content table. A summary of the data appears in the right-hand sidebar when viewing the blog. 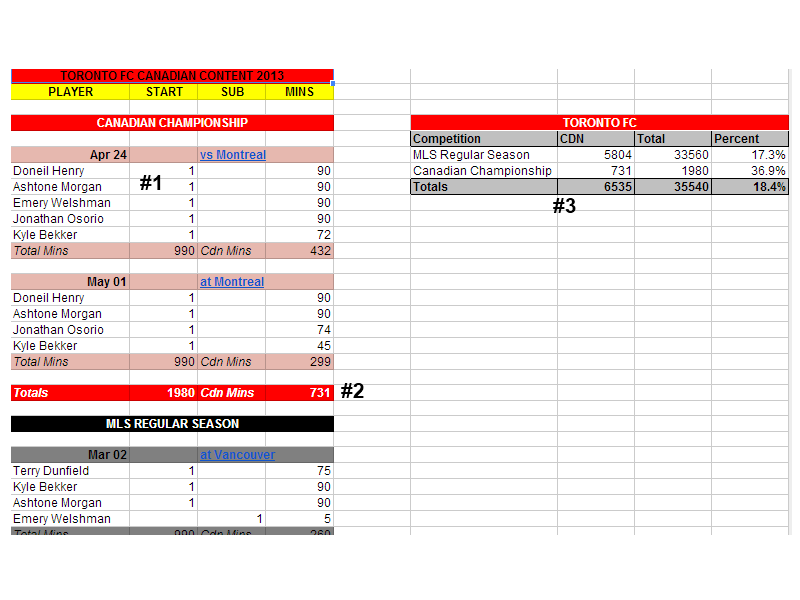 If you're a bit thick, or not spreadsheet-inclined, here's a snapshot from Toronto FC, last year's most Canadian MLS side. Canadian content details, including individual players, for each match, and a link the official match report. Note not all matches will have total minutes played of 990 due to sendings off. Matches are by competition-type, which can include: regular season (NASL and MLS), Voyageurs Cup, Champions League, and (god willing!) playoffs. Friendlies (pre-season, mid-season or other) are not included. Matches from the most recently begun competition will appear at the top. As is often the case, some might debate which players ought to be considered Canadian. My rule of thumb is that players ought to be eligible to play for a Canadian national team. NASL rosters are still in flux, but these are the players for Toronto, Montreal, and Vancouver on their official rosters. If you would like to debate nationalities, proceed to the comments section of this post. I am aware that Wandrille Lefevre (Montreal) could potentiality obtain Canadian citizenship and become eligible for national team participation shortly.